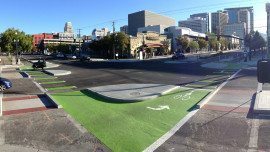 Implementing new bikeways, trails, traffic signals, and pedestrian features can have implications for existing and future traffic operations. Accurately predicting how these changes influence heavy vehicle turning, queuing at intersections and overall level of service can be challenging to understand. 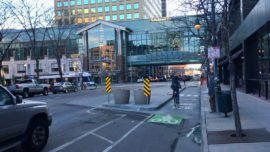 Alta’s traffic engineers understand these complex issues surrounding the installation of pedestrian and bicycle facilities. 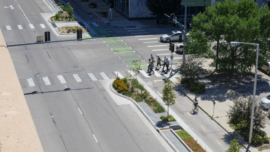 We can accurately model the impacts of new or extended signal phases, new or modified intersection and roadway geometry and the reduction of travel and/or vehicle turning lanes at a variety of intensities of use. 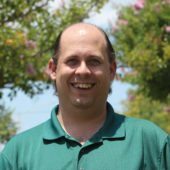 Our engineers utilize industry standard modelling and simulation software such as Synchro, AutoTURN, and VISSIM to accurately predict impacts and optimize strategies that balance the needs of all roadway users. Good intersection design has progressed rapidly in recent years. Features like curb extensions, permissive and protected bicycle and pedestrian signal phasing strategies, advanced detection and actuation, signal controller sophistication, and striping and signage have all contributed to intersections that are safer, easier to understand for all users and more comfortable for bicyclists and pedestrians. Alta provides services from comprehensive traffic analysis through full signal design plans including specifications, signal head and pole placement, signal phasing, and conduit and wiring design. 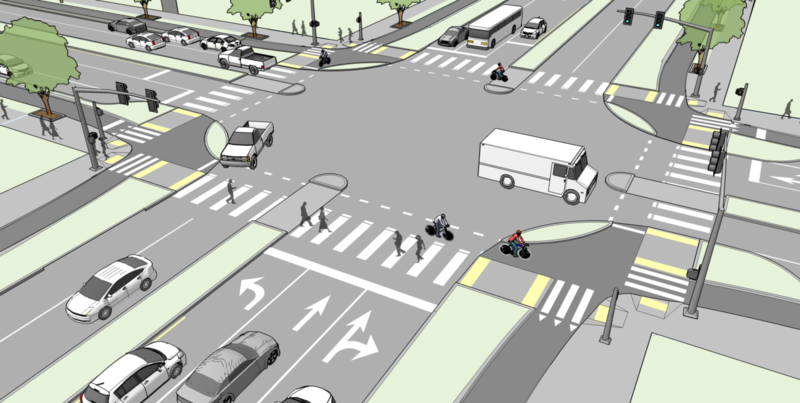 Based on Dutch principals and designed with geometric guidance already found within AASHTO and the MUTCD, protected intersections are an innovative way to organize and make our intersections safer for bicyclists and drivers alike. Protected intersections work best where bikeways meet one another, however, they can be used in single bikeway applications and intersections with unique geometry as well. Features such as bike forward stop bars, refuge islands, and signal enhancements have obvious safety benefits and are easy for engineers and members of the public to understand. Alta has performed traffic analysis of protected intersections to better understand the implications to traffic operations as well as done full geometric design for some of America’s first examples. In recent years, High-intensity Activated crossWalK (HAWK) beacons have become increasingly popular in cities nationwide to improve the safety and comfort for people walking and bicycling when crossing roadways. Alta has developed industry-leading expertise in planning and designing these facilities for use on a variety of roadway types and lane configurations. We have successfully implemented beacons in conjunction with median refuge islands and curb extensions at both mid-block and intersection locations. Our experience has even seen these tools successfully adapted with bicycle-specific features for trail crossing applications and for bicycle boulevard type applications at local roadway crossings of major streets.